Revelation 10:1 - I saw still another mighty angel coming down from heaven, clothed with a cloud. 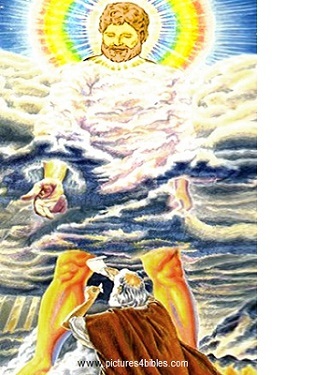 And a rainbow was on his head, his face was like the sun, and his feet like pillars of fire. Revelation 5:1 - And I saw in the right hand of Him who sat on the throne a scroll written inside and on the back, sealed with seven seals. Then I saw a strong angel proclaiming with a loud voice, "Who is worthy to open the scroll and to loose its seals?" Revelation 18:1-2 - After these things I saw another angel coming down from heaven, having great authority, and the earth was illuminated with his glory. And he cried mightily with a loud voice, saying, "Babylon the great is fallen, is fallen, and has become a dwelling place of demons, a prison for every foul spirit, and a cage for every unclean and hated bird!" Revelation 18:21 - Then a mighty angel took up a stone like a great millstone and threw it into the sea, saying, "Thus with violence the great city Babylon shall be thrown down, and shall not be found anymore." Daniel 10:20-21 - Then he said, "Do you know why I have come to you? And now I must return to fight with the prince of Persia; and when I have gone forth, indeed the prince of Greece will come. But I will tell you what is noted in the Scripture of Truth. (No one upholds me against these, except Michael your prince....)"
The Hebrew word "chazaq" translated "upholds" literally means "strong." In other words, Michael has power and strength against evil princes over other nations, or as Paul puts it: "spiritual hosts of wickedness" (Ephesians 6:12). Some speculate that Gabriel is a mighty angel. While he is certainly a special angel sent by God to tell Daniel and Mary about the coming Messiah and Zacharias about John the Baptist, Gabriel is never described as a strong or mighty angel like Michael (Daniel 8-9, Luke 1). Clothed with a cloud Luke 21:27 - Then they will see the Son of Man coming in a cloud with power and great glory. Ezekiel 1:4, 26 - Then I looked, and behold, a whirlwind was coming out of the north, a great cloud with raging fire engulfing itself; and brightness was all around it and radiating out of its midst like the color of amber, out of the midst of the fire.... And above the firmament over their heads was the likeness of a throne, in appearance like a sapphire stone; on the likeness of the throne was a likeness with the appearance of a man high above it. Rainbow on his head Revelation 4:2-3 - Immediately I was in the Spirit; and behold, a throne set in heaven, and One sat on the throne. And He who sat there was like a jasper and a sardius stone in appearance; and there was a rainbow around the throne, in appearance like an emerald. Ezekiel 1:28 - Like the appearance of a rainbow in a cloud on a rainy day, so was the appearance of the brightness all around it. This was the appearance of the likeness of the glory of the LORD. So when I saw it, I fell on my face, and I heard a voice of One speaking. Face like the sun Revelation 1:16 - He had in His right hand seven stars, out of His mouth went a sharp two-edged sword, and His countenance was like the sun shining in its strength. Daniel 10:6 - His body was like beryl, his face like the appearance of lightning, his eyes like torches of fire, his arms and feet like burnished bronze in color, and the sound of his words like the voice of a multitude. Ezekiel 1:27 - Also from the appearance of His waist and upward I saw, as it were, the color of amber with the appearance of fire all around within it; and from the appearance of His waist and downward I saw, as it were, the appearance of fire with brightness all around. Feet like pillars of Fire Revelation 1:15 - His feet were like fine brass, as if refined in a furnace, and His voice as the sound of many waters. Revelation 11:1-4 - Then I was given a reed like a measuring rod. And the angel stood, saying, "Rise and measure the temple of God, the altar, and those who worship there. But leave out the court which is outside the temple, and do not measure it, for it has been given to the Gentiles. And they will tread the holy city underfoot for forty-two months. And I will give power to my two witnesses, and they will prophesy one thousand two hundred and sixty days, clothed in sackcloth." These are the two olive trees and the two lampstands standing before the God of the earth. Another slight difference in Greek texts shows that the command for John to prophesy again is given in the third person plural in one Greek text instead of the third person singular given in another text. In other words, the variant in the text shows that more than one individual was talking to John in the last verse. Since only the mighty angel and the voice from heaven spoke to John in this scene, then both would be speaking to him in the last verse, with uncertainty whether the voice from heaven or the angel continues the dialogue in Revelation 11:1. Even with the textual variants, the mighty angel could be the one claiming the two witnesses as his in both translations. It is due to an assumption that Christ cannot appear as an angel post incarnation that has caused conflicting views due to the ambiguity introduced by variances in the Greek "Critical Text" compared to the "Majority Text." To help clear up this issue let us take a look at this assumption and see if it has biblical merit. Christ pre-incarnate clearly appeared in angelic form being the "Angel of the Lord." Christ glorified, as described in Revelation matches the same descriptions as the pre-incarnate Christ in Daniel and Ezekiel, as shown in the table above. In addition, Christ is convincingly Apollyon the Destroyer, who is the "angel" over the bottomless pit, as discussed in Revelation 9:11. Malachi 3:1 - "Behold, I send My messenger, and he will prepare the way before Me. And the Lord, whom you seek, will suddenly come to His temple, even the Messenger of the covenant, in whom you delight. Behold, He is coming," says the LORD of hosts." The only interpretation that makes sense harmonizing the textual variants - while taking other instances of Christ appearing as an angel both pre-incarnate and in glory into account, in addition to the mighty angel looking and acting like Christ as we will see in the next few sections - is that the mighty angel is Christ. It is interesting that John does not describe to us what the other mighty angels in Revelation looked like, which may suggest this mighty angel is more important that the other mighty angels. Revelation 1:1-2 - The Revelation of Jesus Christ, which God gave Him to show His servants - things which must shortly take place. And He sent and signified it by His angel to His servant John, who bore witness to the word of God, and to the testimony of Jesus Christ, to all things that he saw. Exodus 19:9 - And the LORD said to Moses, "Behold, I come to you in the thick cloud, that the people may hear when I speak with you, and believe you forever." So Moses told the words of the people to the LORD. Ezekiel 1:4, 28 - Then I looked, and behold, a whirlwind was coming out of the north, a great cloud with raging fire engulfing itself; and brightness was all around it and radiating out of its midst like the color of amber, out of the midst of the fire.... Like the appearance of a rainbow in a cloud on a rainy day, so was the appearance of the brightness all around it. 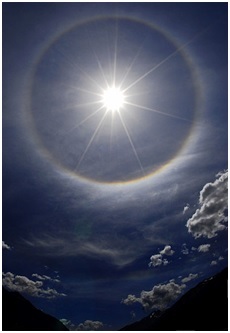 This was the appearance of the likeness of the glory of the LORD. So when I saw it, I fell on my face, and I heard a voice of One speaking. Psalms 18:11-13 - He made darkness His secret place; His canopy around Him was dark waters and thick clouds of the skies. From the brightness before Him, His thick clouds passed with hailstones and coals of fire. The LORD thundered from heaven, and the Most High uttered His voice, hailstones and coals of fire. Psalms 97:1-2, 6 - The LORD reigns; let the earth rejoice; let the multitude of isles be glad! Clouds and darkness surround Him; righteousness and justice are the foundation of His throne.... The heavens declare His righteousness, and all the peoples see His glory. As discussed in Revelation 1:7, Jesus will also return with clouds, which are the armies of Heaven. Daniel 7:13 - "I was watching in the night visions, and behold, One like the Son of Man, coming with the clouds of heaven! He came to the Ancient of Days, and they brought Him near before Him." Revelation 1:7 - Behold, He is coming with clouds, and every eye will see Him, even they who pierced Him. And all the tribes of the earth will mourn because of Him. Even so, Amen. Revelation 19:14 - And the armies in heaven, clothed in fine linen, white and clean, followed Him on white horses. These "clouds," or the armies of Heaven include the saints (Jude 1:14-15, Zechariah 14:4-5) and the holy angels (Matthew 25:31). So while angels appear as clouds, they are never said to be clothed in clouds like this mighty angel, which further supports the conclusion that this angel clothed in a cloud is the Lord Jesus Christ. Revelation 4:2-3 - Immediately I was in the Spirit; and behold, a throne set in heaven, and One sat on the throne. And He who sat there was like a jasper and a sardius stone in appearance; and there was a rainbow around the throne, in appearance like an emerald. Isaiah 54:9-10 - "For this is like the waters of Noah to Me; for as I have sworn that the waters of Noah would no longer cover the earth, so have I sworn that I would not be angry with you, nor rebuke you. For the mountains shall depart and the hills be removed, but My kindness shall not depart from you, nor shall My covenant of peace be removed," Says the LORD, who has mercy on you. Isaiah 24:1-6 - Behold, the LORD makes the earth empty and makes it waste, distorts its surface and scatters abroad its inhabitants. And it shall be: As with the people, so with the priest; as with the servant, so with his master; as with the maid, so with her mistress; as with the buyer, so with the seller; as with the lender, so with the borrower; as with the creditor, so with the debtor. The land shall be entirely emptied and utterly plundered, for the LORD has spoken this word. The earth mourns and fades away, the world languishes and fades away; the haughty people of the earth languish. The earth is also defiled under its inhabitants, because they have transgressed the laws, changed the ordinance, broken the everlasting covenant. Therefore the curse has devoured the earth, and those who dwell in it are desolate. Therefore the inhabitants of the earth are burned, and few men are left. Malachi 3:1-5 - "Behold, I send My messenger, and he will prepare the way before Me. And the Lord, whom you seek, will suddenly come to His temple, even the Messenger of the covenant, in whom you delight. Behold, He is coming," Says the LORD of hosts. "But who can endure the day of His coming? And who can stand when He appears? For He is like a refiner's fire and like launderers' soap. He will sit as a refiner and a purifier of silver; He will purify the sons of Levi, and purge them as gold and silver, that they may offer to the LORD an offering in righteousness. "Then the offering of Judah and Jerusalem will be pleasant to the LORD, as in the days of old, as in former years. And I will come near you for judgment; I will be a swift witness against sorcerers, against adulterers, against perjurers, against those who exploit wage earners and widows and orphans, and against those who turn away an alien - because they do not fear Me," says the LORD of hosts. Matthew 17:1-3 - Now after six days Jesus took Peter, James, and John his brother, led them up on a high mountain by themselves; and He was transfigured before them. His face shone like the sun, and His clothes became as white as the light. And behold, Moses and Elijah appeared to them, talking with Him. Revelation 1:16 - He had in His right hand seven stars, out of His mouth went a sharp two-edged sword, and His countenance was like the sun shining in its strength. Exodus 34:29-30 - Now it was so, when Moses came down from Mount Sinai (and the two tablets of the Testimony were in Moses' hand when he came down from the mountain), that Moses did not know that the skin of his face shone while he talked with Him. So when Aaron and all the children of Israel saw Moses, behold, the skin of his face shone, and they were afraid to come near him. Luke 2:8-9 - Now there were in the same country shepherds living out in the fields, keeping watch over their flock by night. And behold, an angel of the Lord stood before them, and the glory of the Lord shone around them, and they were greatly afraid. Matthew 28:2-3 - And behold, there was a great earthquake; for an angel of the Lord descended from heaven, and came and rolled back the stone from the door, and sat on it. His countenance was like lightning, and his clothing as white as snow. Numbers 14:13-14 - And Moses said to the LORD: "Then the Egyptians will hear it, for by Your might You brought these people up from among them, and they will tell it to the inhabitants of this land. They have heard that You, LORD, are among these people; that You, LORD, are seen face to face and Your cloud stands above them, and You go before them in a pillar of cloud by day and in a pillar of fire by night." Revelation 1:15 - His feet were like fine brass, as if refined in a furnace, and His voice as the sound of many waters. Hebrews 2:8 - "You have put all things in subjection under his feet." For in that He put all in subjection under him, He left nothing that is not put under him. But now we do not yet see all things put under him. Malachi 3:2 - "But who can endure the day of His coming? And who can stand when He appears? For He is like a refiner's fire and like launderers' soap." Malachi 4:1 - "For behold, the day is coming, burning like an oven, and all the proud, yes, all who do wickedly will be stubble. And the day which is coming shall burn them up," Says the LORD of hosts, "That will leave them neither root nor branch. But to you who fear My name the Sun of Righteousness shall arise with healing in His wings; and you shall go out and grow fat like stall-fed calves. You shall trample the wicked, for they shall be ashes under the soles of your feet on the day that I do this," Says the LORD of hosts. Revelation 10:2 - He had a little book open in his hand. Daniel 12:4 - "But you, Daniel, shut up the words, and seal the book until the time of the end...."
Zechariah 5:1-3 - Then I turned and raised my eyes, and saw there a flying scroll. And he said to me, "What do you see?" So I answered, "I see a flying scroll. Its length is twenty cubits and its width ten cubits." Then he said to me, "This is the curse that goes out over the face of the whole earth: 'Every thief shall be expelled,' according to this side of the scroll; and, 'Every perjurer shall be expelled,' according to that side of it." As we will see in Revelation 10:9, the mighty angel commands John to eat the little book. The size of the scroll with God's judgments against the earth would make it impossible for John to eat. In addition, no one was worthy to open or even look at this larger scroll except Christ (Revelation 5:3), so it doesn't make sense that John would eat it, especially since it is also the "purchase deed" to the earth, as discussed in Revelation 5:1. It will become clear later in Revelation 10:8 what this little book is, and why John must eat it. The mighty angel comes down from Heaven and sets his right foot on the sea and left foot on the land. As discussed in Revelation 10:1, this imagery is a symbolic act of putting the earth under subjection, which is a picture of Jesus declaring His authority over the earth (1 Corinthians 15:24-28, Hebrews 2:8). 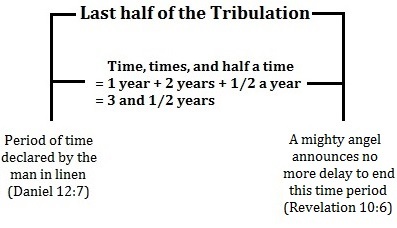 Christ's physical possession of the earth does not actually occur until God finishes His wrath in the Bowl judgments at the end of the Tribulation, but He proclaims His dominion at the sounding of the seventh Trumpet, before the Bowl judgments (Revelation 11:15). Leviticus 8:22-27 - And he brought the second ram, the ram of consecration. Then Aaron and his sons laid their hands on the head of the ram, and Moses killed it. Also he took some of its blood and put it on the tip of Aaron's right ear, on the thumb of his right hand, and on the big toe of his right foot. Then he brought Aaron's sons. And Moses put some of the blood on the tips of their right ears, on the thumbs of their right hands, and on the big toes of their right feet. And Moses sprinkled the blood all around on the altar. Then he took the fat and the fat tail, all the fat that was on the entrails, the fatty lobe attached to the liver, the two kidneys and their fat, and the right thigh; and from the basket of unleavened bread that was before the LORD he took one unleavened cake, a cake of bread anointed with oil, and one wafer, and put them on the fat and on the right thigh; and he put all these in Aaron's hands and in his sons' hands, and waved them as a wave offering before the LORD. Genesis 3:15 - "And I will put enmity between you and the woman, and between your seed and her Seed; He shall bruise your head, and you shall bruise His heel." Romans 16:20 - And the God of peace will crush Satan under your feet shortly. The grace of our Lord Jesus Christ be with you. Amen. 2 Samuel 22:39 - And I have destroyed them and wounded them, so that they could not rise; they have fallen under my feet. Revelation 10:3 - ...and cried with a loud voice, as when a lion roars. When he cried out, seven thunders uttered their voices. The difference between these two roars reminds me of a scene in the movie "The Lion King," where the young lion tries to roar but it comes out more like a wimpy howl, but the adult lion's roar overtakes the young lion's roar like a mighty thunder. (Click here for movie clip). This makes Satan's attempt at roaring seem rather humorous. Jeremiah 25:29-31, 38 - '"For behold, I begin to bring calamity on the city which is called by My name, and should you be utterly unpunished? You shall not be unpunished, for I will call for a sword on all the inhabitants of the earth," says the LORD of hosts.' "Therefore prophesy against them all these words, and say to them: 'The LORD will roar from on high, and utter His voice from His holy habitation; He will roar mightily against His fold. He will give a shout, as those who tread the grapes, against all the inhabitants of the earth. A noise will come to the ends of the earth - for the LORD has a controversy with the nations; He will plead His case with all flesh. He will give those who are wicked to the sword,' says the LORD...." He has left His lair like the lion; for their land is desolate because of the fierceness of the Oppressor, and because of His fierce anger." Joel 3:12-16 - "Let the nations be wakened, and come up to the Valley of Jehoshaphat; for there I will sit to judge all the surrounding nations. Put in the sickle, for the harvest is ripe. Come, go down; for the winepress is full, the vats overflow - for their wickedness is great." Multitudes, multitudes in the valley of decision! For the day of the LORD is near in the valley of decision. The sun and moon will grow dark, and the stars will diminish their brightness. The LORD also will roar from Zion, and utter His voice from Jerusalem; the heavens and earth will shake; but the LORD will be a shelter for His people, and the strength of the children of Israel. Isaiah 31:4-5 - For thus the LORD has spoken to me: "As a lion roars, and a young lion over his prey (when a multitude of shepherds is summoned against him, he will not be afraid of their voice nor be disturbed by their noise), so the LORD of hosts will come down to fight for Mount Zion and for its hill. Like birds flying about, so will the LORD of hosts defend Jerusalem. Defending, He will also deliver it; passing over, He will preserve it." Psalms 18:13 - The LORD thundered from heaven, and the Most High uttered His voice, hailstones and coals of fire. The Scriptures show that only the Lord and the living creatures have voices like thunder. After the mighty angel roars, John hears seven thunders. The Greek word "heautou" as a reflexive pronoun indicates that the seven thunders each uttered their own voice. Since there are seven distinct voices, this rules out the four living creatures as uttering the thunders and suggests that the seven thunders are from the Lord instead. Psalms 29:1-11 - A Psalm of David. Give unto the LORD, O you mighty ones, give unto the LORD glory and strength. Give unto the LORD the glory due to His name; worship the LORD in the beauty of holiness. the God of glory thunders; the LORD is over many waters. The voice of the LORD breaks the cedars, yes, the LORD splinters the cedars of Lebanon. and strips the forests bare; and in His temple everyone says, "Glory!" The LORD sat enthroned at the Flood, and the LORD sits as King forever. The LORD will give strength to His people; the LORD will bless His people with peace. Revelation 4:5 - And from the throne proceeded lightnings, thunderings, and voices. Seven lamps of fire were burning before the throne, which are the seven Spirits of God. Revelation 8:5 - Then the angel took the censer, filled it with fire from the altar, and threw it to the earth. And there were noises, thunderings, lightnings, and an earthquake. Revelation 16:18 - And there were noises and thunderings and lightnings; and there was a great earthquake, such a mighty and great earthquake as had not occurred since men were on the earth. It should not surprise us that the Lord's voice is sevenfold. The Holy Spirit is sevenfold (Revelation 4:5, 5:6) and the Lamb of God has seven horns which show His perfect power and authority, as discussed in Revelation 5:6. "Seven" is the number for perfection, or fullness. (See "Prophetic Patterns in Numbers"). This number is replete throughout Revelation and points to the Lord and His perfection. Revelation 10:4 - Now when the seven thunders uttered their voices, I was about to write; but I heard a voice from heaven saying to me, "Seal up the things which the seven thunders uttered, and do not write them." John hears what the seven thunders say and apparently understood what they said, because he was about to write what he heard. However, a voice from Heaven tells John not to write what he heard, but to seal them up. As discussed in Revelation 5:1, to "seal" something in the Greek means to close or make it secure. Daniel 8:26 - "And the vision of the evenings and mornings which was told is true; therefore seal up the vision, for it refers to many days in the future." In Daniel's case, sealing the book meant that it would not be understood until the time of the end. In contrast, John is not to even write what he heard the seven thunders say, yet the voice from Heaven commanded him to seal them up. This means John could not share with anyone what he had heard; he sealed them in his mind. Psalms 29:10-11 - The LORD sat enthroned at the Flood, and the LORD sits as King forever. The LORD will give strength to His people; the LORD will bless His people with peace. Deuteronomy 29:29 - "The secret things belong to the LORD our God, but those things which are revealed belong to us and to our children forever, that we may do all the words of this law." Proverbs 25:2 - It is the glory of God to conceal a matter, but the glory of kings is to search out a matter. Similarly, Daniel had to seal up the prophetic message he wrote down, because it could not be understood until the time of the end. In other words, it was pointless for Daniel to try to understand because he couldn't understand without living in that time. How could Daniel understand how travel and knowledge would advance in the end times (Daniel 12:4)? It could only be understood by this generation who can fly around the world in a day and have access to a massive amount of knowledge at the click of a mouse. Seeing this prophecy revealed is useful to gauge the times we live in. Perhaps the seven thunders are only sealed until the time we can understand them like Daniel. I suspect we will all hear and understand what the seven thunders said when this prophecy plays out in real-time. Genesis 14:22-23 - But Abram said to the king of Sodom, "I have raised my hand to the LORD, God Most High, the Possessor of heaven and earth, that I will take nothing, from a thread to a sandal strap, and that I will not take anything that is yours, lest you should say, 'I have made Abram rich....'"
Deuteronomy 32:39-41 - Now see that I, even I, am He, and there is no God besides Me; I kill and I make alive; I wound and I heal; nor is there any who can deliver from My hand. For I raise My hand to heaven, and say, "As I live forever, if I whet My glittering sword, and My hand takes hold on judgment, I will render vengeance to My enemies, and repay those who hate Me." Ezekiel 20:5 - "Say to them, 'Thus says the Lord GOD: "On the day when I chose Israel and raised My hand in an oath to the descendants of the house of Jacob, and made Myself known to them in the land of Egypt, I raised My hand in an oath to them, saying, 'I am the LORD your God.' On that day I raised My hand in an oath to them, to bring them out of the land of Egypt into a land that I had searched out for them, 'flowing with milk and honey,' the glory of all lands." Ezekiel 20:15-16 - So I also raised My hand in an oath to them in the wilderness, that I would not bring them into the land which I had given them, 'flowing with milk and honey,' the glory of all lands, because they despised My judgments and did not walk in My statutes, but profaned My Sabbaths; for their heart went after their idols. Ezekiel 20:23-24 - Also I raised My hand in an oath to those in the wilderness, that I would scatter them among the Gentiles and disperse them throughout the countries, because they had not executed My judgments, but had despised My statutes, profaned My Sabbaths, and their eyes were fixed on their fathers' idols. Ezekiel 20:28 - When I brought them into the land concerning which I had raised My hand in an oath to give them, and they saw all the high hills and all the thick trees, there they offered their sacrifices and provoked Me with their offerings. There they also sent up their sweet aroma and poured out their drink offerings. Ezekiel 20:42 - Then you shall know that I am the LORD, when I bring you into the land of Israel, into the country for which I raised My hand in an oath to give to your fathers. Ezekiel 36:7 - Therefore thus says the Lord GOD: "I have raised My hand in an oath that surely the nations that are around you shall bear their own shame." Ezekiel 44:12 - "Because they ministered to them before their idols and caused the house of Israel to fall into iniquity, therefore I have raised My hand in an oath against them," says the Lord GOD, "that they shall bear their iniquity." Psalms 106:26-27 - Therefore He raised His hand in an oath against them, to overthrow them in the wilderness, to overthrow their descendants among the nations, and to scatter them in the lands. Hebrews 6:13 - For when God made a promise to Abraham, because He could swear by no one greater, He swore by Himself, saying, "Surely blessing I will bless you, and multiplying I will multiply you." Genesis 22:15-17 - Then the Angel of the LORD called to Abraham a second time out of heaven, and said: "By Myself I have sworn, says the LORD, because you have done this thing, and have not withheld your son, your only son - blessing I will bless you, and multiplying I will multiply your descendants as the stars of the heaven and as the sand which is on the seashore; and your descendants shall possess the gate of their enemies." Isaiah 45:22-23 - "Look to Me, and be saved, all you ends of the earth! For I am God, and there is no other. I have sworn by Myself; the word has gone out of My mouth in righteousness, and shall not return, that to Me every knee shall bow, every tongue shall take an oath." Jeremiah 22:5 - "But if you will not hear these words, I swear by Myself," says the LORD, "that this house shall become a desolation." Jeremiah 44:26 - Therefore hear the word of the LORD, all Judah who dwell in the land of Egypt: 'Behold, I have sworn by My great name,' says the LORD, 'that My name shall no more be named in the mouth of any man of Judah in all the land of Egypt, saying, "The Lord GOD lives." Amos 6:8 - The Lord GOD has sworn by Himself, the LORD God of hosts says: "I abhor the pride of Jacob, and hate his palaces; therefore I will deliver up the city and all that is in it." In the next section we see the mighty angel swearing by God. The angel making an oath by lifting his hand and swearing by God the same way the Lord does in the Old Testament supports the notion that the mighty angel is Christ, especially since this angel puts the earth under subjection, which is what Christ will do at the end of the Tribulation, as discussed in Revelation 10:2. Psalms 146:5-7 - Happy is he who has the God of Jacob for his help, whose hope is in the LORD his God, who made heaven and earth, the sea, and all that is in them; who keeps truth forever, who executes justice for the oppressed, who gives food to the hungry. The LORD gives freedom to the prisoners. Acts 14:11-16 - Now when the people saw what Paul had done, they raised their voices, saying in the Lycaonian language, "The gods have come down to us in the likeness of men!" And Barnabas they called Zeus, and Paul, Hermes, because he was the chief speaker. Then the priest of Zeus, whose temple was in front of their city, brought oxen and garlands to the gates, intending to sacrifice with the multitudes. But when the apostles Barnabas and Paul heard this, they tore their clothes and ran in among the multitude, crying out and saying, "Men, why are you doing these things? We also are men with the same nature as you, and preach to you that you should turn from these useless things to the living God, who made the heaven, the earth, the sea, and all things that are in them, who in bygone generations allowed all nations to walk in their own ways." Revelation 14:6 - Then I saw another angel flying in the midst of heaven, having the everlasting gospel to preach to those who dwell on the earth to every nation, tribe, tongue, and people - saying with a loud voice, "Fear God and give glory to Him, for the hour of His judgment has come; and worship Him who made heaven and earth, the sea and springs of water." Daniel 12:6-7 - "And one said to the man clothed in linen, who was above the waters of the river, "How long shall the fulfillment of these wonders be?" Then I heard the man clothed in linen, who was above the waters of the river, when he held up his right hand and his left hand to heaven, and swore by Him who lives forever, that it shall be for a time, times, and half a time; and when the power of the holy people has been completely shattered, all these things shall be finished. Revelation 1:13-16 - ... and in the midst of the seven lampstands One like the Son of Man, clothed with a garment down to the feet and girded about the chest with a golden band. His head and hair were white like wool, as white as snow, and His eyes like a flame of fire; His feet were like fine brass, as if refined in a furnace, and His voice as the sound of many waters; He had in His right hand seven stars, out of His mouth went a sharp two-edged sword, and His countenance was like the sun shining in its strength. Click here to review all the passages that describe Christ and His different appearances. Daniel 12:1 - At that time Michael shall stand up, the great prince who stands watch over the sons of your people; and there shall be a time of trouble, such as never was since there was a nation, even to that time. And at that time your people shall be delivered, every one who is found written in the book. Daniel 12:7-13 - Then I heard the man clothed in linen, who was above the waters of the river, when he held up his right hand and his left hand to heaven, and swore by Him who lives forever, that it shall be for a time, times, and half a time; and when the power of the holy people has been completely shattered, all these things shall be finished. Although I heard, I did not understand. Then I said, "My lord, what shall be the end of these things?" And he said, "Go your way, Daniel, for the words are closed up and sealed till the time of the end. Many shall be purified, made white, and refined, but the wicked shall do wickedly; and none of the wicked shall understand, but the wise shall understand. And from the time that the daily sacrifice is taken away, and the abomination of desolation is set up, there shall be one thousand two hundred and ninety days. Blessed is he who waits, and comes to the one thousand three hundred and thirty-five days. But you, go your way till the end; for you shall rest, and will arise to your inheritance at the end of the days." Matthew 24:15-21 - "Therefore when you see the 'Abomination of desolation,' spoken of by Daniel the prophet, standing in the holy place" (whoever reads, let him understand), "then let those who are in Judea flee to the mountains. Let him who is on the housetop not go down to take anything out of his house. And let him who is in the field not go back to get his clothes. But woe to those who are pregnant and to those who are nursing babies in those days! And pray that your flight may not be in winter or on the Sabbath. For then there will be great tribulation, such as has not been since the beginning of the world until this time, no, nor ever shall be." Habakkuk 2:2 - Then the LORD answered me and said: "Write the vision and make it plain on tablets, that he may run who reads it. For the vision is yet for an appointed time; but at the end it will speak, and it will not lie. Though it tarries, wait for it; because it will surely come, it will not tarry." Daniel 11:35 - And some of those of understanding shall fall, to refine them, purify them, and make them white, until the time of the end; because it is still for the appointed time. Revelation 10:7 - ...but in the days of the sounding of the seventh angel, when he is about to sound, the mystery of God would be finished, as He declared to His servants the prophets. As we will see in future chapters, the sounding of the seventh Trumpet ushers in the final act of the Tribulation before Jesus physically returns to the earth to establish the Kingdom. The last Trumpet judgment finishes the "mystery of God." Romans 11:7, 11, 25-27 - What then? Israel has not obtained what it seeks; but the elect have obtained it, and the rest were blinded.... I say then, have they stumbled that they should fall? Certainly not! But through their fall, to provoke them to jealousy, salvation has come to the Gentiles.... For I do not desire, brethren, that you should be ignorant of this mystery, lest you should be wise in your own opinion, that blindness in part has happened to Israel until the fullness of the Gentiles has come in. And so all Israel will be saved, as it is written: "The Deliverer will come out of Zion, and He will turn away ungodliness from Jacob; for this is My covenant with them, when I take away their sins." 1 Corinthians 2:1, 6-8 - And I, brethren, when I came to you, did not come with excellence of speech or of wisdom declaring to you the testimony of God.... However, we speak wisdom among those who are mature, yet not the wisdom of this age, nor of the rulers of this age, who are coming to nothing. But we speak the wisdom of God in a mystery, the hidden wisdom which God ordained before the ages for our glory, which none of the rulers of this age knew; for had they known, they would not have crucified the Lord of glory. Amos 3:7 - Surely the Lord GOD does nothing, unless He reveals His secret to His servants the prophets. Colossians 1:24 - I now rejoice in my sufferings for you, and fill up in my flesh what is lacking in the afflictions of Christ, for the sake of His body, which is the church, of which I became a minister according to the stewardship from God which was given to me for you, to fulfill the word of God, the mystery which has been hidden from ages and from generations, but now has been revealed to His saints. To them God willed to make known what are the riches of the glory of this mystery among the Gentiles: which is Christ in you, the hope of glory. Isaiah 11:10 - "And in that day there shall be a Root of Jesse, who shall stand as a banner to the people; for the Gentiles shall seek Him, and His resting place shall be glorious." Isaiah 42:1-6 - "Behold! My Servant whom I uphold, My Elect One in whom My soul delights! I have put My Spirit upon Him; He will bring forth justice to the Gentiles. He will not cry out, nor raise His voice, nor cause His voice to be heard in the street. A bruised reed He will not break, and smoking flax He will not quench; He will bring forth justice for truth. He will not fail nor be discouraged, till He has established justice in the earth; and the coastlands shall wait for His law." Thus says God the LORD, who created the heavens and stretched them out, who spread forth the earth and that which comes from it, who gives breath to the people on it, and spirit to those who walk on it: "I, the LORD, have called You in righteousness, and will hold Your hand; I will keep You and give You as a covenant to the people, as a light to the Gentiles...."
Isaiah 49:6-10 - Indeed He says, 'It is too small a thing that You should be My Servant to raise up the tribes of Jacob, and to restore the preserved ones of Israel; I will also give You as a light to the Gentiles, that You should be My salvation to the ends of the earth.' " Thus says the LORD, the Redeemer of Israel, their Holy One, to Him whom man despises, to Him whom the nation abhors, to the Servant of rulers: "Kings shall see and arise, princes also shall worship, because of the LORD who is faithful, the Holy One of Israel; and He has chosen You." Thus says the LORD: "In an acceptable time I have heard You, and in the day of salvation I have helped You; I will preserve You and give You as a covenant to the people, to restore the earth, to cause them to inherit the desolate heritages; that You may say to the prisoners, 'Go forth,' to those who are in darkness, 'Show yourselves.' "They shall feed along the roads, and their pastures shall be on all desolate heights. They shall neither hunger nor thirst, neither heat nor sun shall strike them; for He who has mercy on them will lead them, even by the springs of water He will guide them." Isaiah 60:3-5, 11, 16 - The Gentiles shall come to your light, and kings to the brightness of your rising. "Lift up your eyes all around, and see: They all gather together, they come to you; your sons shall come from afar, and your daughters shall be nursed at your side. Then you shall see and become radiant, and your heart shall swell with joy; because the abundance of the sea shall be turned to you, the wealth of the Gentiles shall come to you...." Therefore your gates shall be open continually; they shall not be shut day or night, that men may bring to you the wealth of the Gentiles, and their kings in procession.... You shall drink the milk of the Gentiles, and milk the breast of kings; you shall know that I, the LORD, am your Savior and your Redeemer, the Mighty One of Jacob. Isaiah 61:6, 9-11 - But you shall be named the priests of the LORD, they shall call you the servants of our God. You shall eat the riches of the Gentiles, and in their glory you shall boast.... Their descendants shall be known among the Gentiles, and their offspring among the people. All who see them shall acknowledge them, that they are the posterity whom the LORD has blessed. I will greatly rejoice in the LORD, my soul shall be joyful in my God; for He has clothed me with the garments of salvation, He has covered me with the robe of righteousness, as a bridegroom decks himself with ornaments, and as a bride adorns herself with her jewels. For as the earth brings forth its bud, as the garden causes the things that are sown in it to spring forth, so the Lord GOD will cause righteousness and praise to spring forth before all the nations. Isaiah 62:1-2 - For Zion's sake I will not hold My peace, and for Jerusalem's sake I will not rest, until her righteousness goes forth as brightness, and her salvation as a lamp that burns. The Gentiles shall see your righteousness, and all kings your glory. You shall be called by a new name, which the mouth of the LORD will name. Isaiah 66:10-12 - "Rejoice with Jerusalem, and be glad with her, all you who love her; rejoice for joy with her, all you who mourn for her; that you may feed and be satisfied with the consolation of her bosom, that you may drink deeply and be delighted with the abundance of her glory." For thus says the LORD: "Behold, I will extend peace to her like a river, and the glory of the Gentiles like a flowing stream. Then you shall feed; on her sides shall you be carried, and be dandled on her knees." Isaiah 66:15-19 - For behold, the LORD will come with fire and with His chariots, like a whirlwind, to render His anger with fury, and His rebuke with flames of fire. For by fire and by His sword the LORD will judge all flesh; and the slain of the LORD shall be many. "Those who sanctify themselves and purify themselves, to go to the gardens after an idol in the midst, eating swine's flesh and the abomination and the mouse, shall be consumed together," says the LORD. "For I know their works and their thoughts. It shall be that I will gather all nations and tongues; and they shall come and see My glory. I will set a sign among them; and those among them who escape I will send to the nations: to Tarshish and Pul and Lud, who draw the bow, and Tubal and Javan, to the coastlands afar off who have not heard My fame nor seen My glory. And they shall declare My glory among the Gentiles." Jeremiah 16:19 - O LORD, my strength and my fortress, my refuge in the day of affliction, the Gentiles shall come to You from the ends of the earth and say, "Surely our fathers have inherited lies, worthlessness and unprofitable things." Amos 9:11-14 - "On that day I will raise up the tabernacle of David, which has fallen down, and repair its damages; I will raise up its ruins, and rebuild it as in the days of old; that they may possess the remnant of Edom, and all the Gentiles who are called by My name," says the LORD who does this thing. "Behold, the days are coming," says the LORD, "When the plowman shall overtake the reaper, and the treader of grapes him who sows seed; the mountains shall drip with sweet wine, and all the hills shall flow with it. I will bring back the captives of My people Israel; they shall build the waste cities and inhabit them; they shall plant vineyards and drink wine from them; they shall also make gardens and eat fruit from them." Malachi 1:11 - "For from the rising of the sun, even to its going down, My name shall be great among the Gentiles; in every place incense shall be offered to My name, and a pure offering; for My name shall be great among the nations," Says the LORD of hosts. Revelation 10:8 - Then the voice which I heard from heaven spoke to me again and said, "Go, take the little book which is open in the hand of the angel who stands on the sea and on the earth." 2 Peter 1:17-18 - For He received from God the Father honor and glory when such a voice came to Him from the Excellent Glory: "This is My beloved Son, in whom I am well pleased." And we heard this voice which came from heaven when we were with Him on the holy mountain. John 12:28-32 - "Father, glorify Your name." Then a voice came from heaven, saying, "I have both glorified it and will glorify it again." Therefore the people who stood by and heard it said that it had thundered. Others said, "An angel has spoken to Him." Jesus answered and said, "This voice did not come because of Me, but for your sake. Now is the judgment of this world; now the ruler of this world will be cast out. And I, if I am lifted up from the earth, will draw all peoples to Myself." The mighty angel held the little book in his hand when he swore the oath that there would be no more delay to finish the 3 ½ year period shown to Daniel, as discussed in Revelation 10:6. This suggests that the little book is the same prophecy the man in linen gave to Daniel. 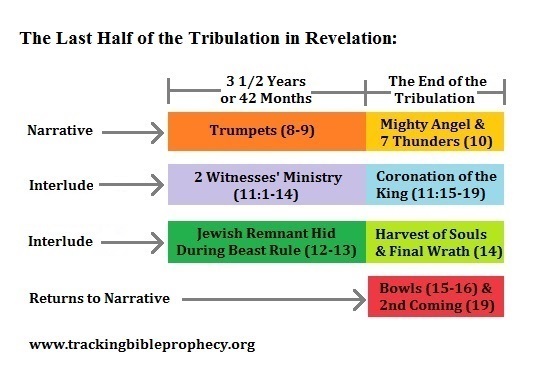 The last few sections will show that the little book is prophetic and we will see in Revelation 10:11 that this is the same 3 ½ year period shown to Daniel. Revelation 10:9-10 - So I went to the angel and said to him, "Give me the little book." And he said to me, "Take and eat it; and it will make your stomach bitter, but it will be as sweet as honey in your mouth." Then I took the little book out of the angel's hand and ate it, and it was as sweet as honey in my mouth. But when I had eaten it, my stomach became bitter. Ezekiel 2:3 - And He said to me: "Son of man, I am sending you to the children of Israel, to a rebellious nation that has rebelled against Me; they and their fathers have transgressed against Me to this very day. For they are impudent and stubborn children. I am sending you to them, and you shall say to them, 'Thus says the Lord GOD.' As for them, whether they hear or whether they refuse - for they are a rebellious house - yet they will know that a prophet has been among them. And you, son of man, do not be afraid of them nor be afraid of their words, though briers and thorns are with you and you dwell among scorpions; do not be afraid of their words or dismayed by their looks, though they are a rebellious house." Ezekiel 2:7-10 - "You shall speak My words to them, whether they hear or whether they refuse, for they are rebellious. But you, son of man, hear what I say to you. Do not be rebellious like that rebellious house; open your mouth and eat what I give you." Now when I looked, there was a hand stretched out to me; and behold, a scroll of a book was in it. Then He spread it before me; and there was writing on the inside and on the outside, and written on it were lamentations and mourning and woe. Ezekiel 3:1-4 - Moreover He said to me, "Son of man, eat what you find; eat this scroll, and go, speak to the house of Israel." So I opened my mouth, and He caused me to eat that scroll. And He said to me, "Son of man, feed your belly, and fill your stomach with this scroll that I give you." So I ate, and it was in my mouth like honey in sweetness. Then He said to me: "Son of man, go to the house of Israel and speak with My words to them." Ezekiel 3:5-9 - "For you are not sent to a people of unfamiliar speech and of hard language, but to the house of Israel, not to many people of unfamiliar speech and of hard language, whose words you cannot understand. Surely, had I sent you to them, they would have listened to you. But the house of Israel will not listen to you, because they will not listen to Me; for all the house of Israel are impudent and hard-hearted. Behold, I have made your face strong against their faces, and your forehead strong against their foreheads. Like adamant stone, harder than flint, I have made your forehead; do not be afraid of them, nor be dismayed at their looks, though they are a rebellious house." Ezekiel 3:10-14 - Moreover He said to me: "Son of man, receive into your heart all My words that I speak to you, and hear with your ears. And go, get to the captives, to the children of your people, and speak to them and tell them, 'Thus says the Lord GOD,' whether they hear, or whether they refuse." Then the Spirit lifted me up, and I heard behind me a great thunderous voice: "Blessed is the glory of the LORD from His place!" I also heard the noise of the wings of the living creatures that touched one another, and the noise of the wheels beside them, and a great thunderous noise. So the Spirit lifted me up and took me away, and I went in bitterness, in the heat of my spirit; but the hand of the LORD was strong upon me. Jeremiah 15:15-18 - O LORD, You know; remember me and visit me, and take vengeance for me on my persecutors. In Your enduring patience, do not take me away. Know that for Your sake I have suffered rebuke. Your words were found, and I ate them, and Your word was to me the joy and rejoicing of my heart; for I am called by Your name, O LORD God of hosts. I did not sit in the assembly of the mockers, nor did I rejoice; I sat alone because of Your hand, for You have filled me with indignation. Why is my pain perpetual and my wound incurable, which refuses to be healed? Will You surely be to me like an unreliable stream, as waters that fail? Daniel 8:23-27 - ... A king shall arise, having fierce features, who understands sinister schemes. His power shall be mighty, but not by his own power; he shall destroy fearfully, and shall prosper and thrive; he shall destroy the mighty, and also the holy people. "Through his cunning he shall cause deceit to prosper under his rule; and he shall exalt himself in his heart. He shall destroy many in their prosperity. He shall even rise against the Prince of princes; but he shall be broken without human means. "And the vision of the evenings and mornings which was told is true; therefore seal up the vision, for it refers to many days in the future." And I, Daniel, fainted and was sick for days; afterward I arose and went about the king's business. I was astonished by the vision, but no one understood it. Lamentations 3:1, 5, 14-15, 18-24, 37-38 - I am the man who has seen affliction by the rod of His wrath.... He has besieged me and surrounded me with bitterness and woe.... I have become the ridicule of all my people - their taunting song all the day. He has filled me with bitterness, He has made me drink wormwood.... And I said, "My strength and my hope have perished from the LORD." Remember my affliction and roaming, the wormwood and the gall. My soul still remembers and sinks within me. This I recall to my mind, therefore I have hope. Through the LORD's mercies we are not consumed, because His compassions fail not. They are new every morning; great is Your faithfulness. "The LORD is my portion," says my soul, "Therefore I hope in Him!".... Who is he who speaks and it comes to pass, when the Lord has not commanded it? Is it not from the mouth of the Most High that woe and well-being proceed? Psalms 119:103 - How sweet are Your words to my taste, sweeter than honey to my mouth! Psalms 19:9-11 - The fear of the LORD is clean, enduring forever; the judgments of the LORD are true and righteous altogether. More to be desired are they than gold, yea, than much fine gold; sweeter also than honey and the honeycomb. Moreover by them Your servant is warned, and in keeping them there is great reward. Psalms 34:8 - Oh, taste and see that the LORD is good; blessed is the man who trusts in Him! Jeremiah 15:16 - Your words were found, and I ate them, and Your word was to me the joy and rejoicing of my heart; for I am called by Your name, O LORD God of hosts. Deuteronomy 8:3 - So He humbled you, allowed you to hunger, and fed you with manna which you did not know nor did your fathers know, that He might make you know that man shall not live by bread alone; but man lives by every word that proceeds from the mouth of the LORD. Exodus 16:31 - And the house of Israel called its name Manna. And it was like white coriander seed, and the taste of it was like wafers made with honey. Exodus 16:16-20 - "This is the thing which the LORD has commanded: 'Let every man gather it according to each one's need, one omer for each person, according to the number of persons; let every man take for those who are in his tent.' " Then the children of Israel did so and gathered, some more, some less. So when they measured it by omers, he who gathered much had nothing left over, and he who gathered little had no lack. Every man had gathered according to each one's need. And Moses said, "Let no one leave any of it till morning." Notwithstanding they did not heed Moses. But some of them left part of it until morning, and it bred worms and stank. And Moses was angry with them. Exodus 16:23-28 - Then he said to them, "This is what the LORD has said: 'Tomorrow is a Sabbath rest, a holy Sabbath to the LORD. Bake what you will bake today, and boil what you will boil; and lay up for yourselves all that remains, to be kept until morning.' " So they laid it up till morning, as Moses commanded; and it did not stink, nor were there any worms in it. Then Moses said, "Eat that today, for today is a Sabbath to the LORD; today you will not find it in the field. Six days you shall gather it, but on the seventh day, the Sabbath, there will be none." Now it happened that some of the people went out on the seventh day to gather, but they found none. And the LORD said to Moses, "How long do you refuse to keep My commandments and My laws?" Similarly, those who rebel against God's sweet and good Word will reap the curses and not the blessings in the Word. Unfortunately, for John, taking the responsibility to prophesy against those who rebel against God's word is a "bitter pill" to swallow. Revelation 10:11 - And he said to me, "You must prophesy again about many peoples, nations, tongues, and kings." As discussed in the last few sections, the contents of the "little book" are clearly God's prophesied judgment. Ezekiel and Jeremiah ate prophetic messages about Israel (Ezekiel 2-3, Jeremiah 15). The mighty angel tells John that the prophetic message he ate is about many "peoples, nations, tongues, and kings" that he has already prophesied about. As discussed in Revelation 7:9, the four-fold aspect of these divisions of people shows a relationship between humans and the earth. These divisions also show representation among all people groups. Genesis 11:6-9 - And the LORD said, "Indeed the people are one and they all have one language, and this is what they begin to do; now nothing that they propose to do will be withheld from them. Come, let Us go down and there confuse their language, that they may not understand one another's speech." So the LORD scattered them abroad from there over the face of all the earth, and they ceased building the city. Therefore its name is called Babel, because there the LORD confused the language of all the earth; and from there the LORD scattered them abroad over the face of all the earth. Revelation 13:4-7 - So they worshiped the dragon who gave authority to the beast; and they worshiped the beast, saying, "Who is like the beast? Who is able to make war with him?" And he was given a mouth speaking great things and blasphemies, and he was given authority to continue for forty-two months. Then he opened his mouth in blasphemy against God, to blaspheme His name, His tabernacle, and those who dwell in heaven. It was granted to him to make war with the saints and to overcome them. And authority was given him over every tribe, tongue, and nation. Daniel 2:40-44 - And the fourth kingdom shall be as strong as iron, inasmuch as iron breaks in pieces and shatters everything; and like iron that crushes, that kingdom will break in pieces and crush all the others. Whereas you saw the feet and toes, partly of potter's clay and partly of iron, the kingdom shall be divided; yet the strength of the iron shall be in it, just as you saw the iron mixed with ceramic clay. And as the toes of the feet were partly of iron and partly of clay, so the kingdom shall be partly strong and partly fragile. As you saw iron mixed with ceramic clay, they will mingle with the seed of men; but they will not adhere to one another, just as iron does not mix with clay. And in the days of these kings the God of heaven will set up a kingdom which shall never be destroyed; and the kingdom shall not be left to other people; it shall break in pieces and consume all these kingdoms, and it shall stand forever. Zephaniah 3:8-9 - "Therefore wait for Me," says the LORD, "Until the day I rise up for plunder; My determination is to gather the nations to My assembly of kingdoms, to pour on them My indignation, all My fierce anger; all the earth shall be devoured with the fire of My jealousy. "For then I will restore to the peoples a pure language, that they all may call on the name of the LORD, to serve Him with one accord." Revelation 5:9-10 - And they sang a new song, saying: "You are worthy to take the scroll, and to open its seals; for You were slain, and have redeemed us to God by Your blood out of every tribe and tongue and people and nation, and have made us kings and priests to our God; and we shall reign on the earth." Revelation 7:9-10 - After these things I looked, and behold, a great multitude which no one could number, of all nations, tribes, peoples, and tongues, standing before the throne and before the Lamb, clothed with white robes, with palm branches in their hands, and crying out with a loud voice, saying, "Salvation belongs to our God who sits on the throne, and to the Lamb!" Revelation 11:9-10 - Then those from the peoples, tribes, tongues, and nations will see their dead bodies three-and-a-half days, and not allow their dead bodies to be put into graves. And those who dwell on the earth will rejoice over them, make merry, and send gifts to one another, because these two prophets tormented those who dwell on the earth. Revelation 17:12-15 - "The ten horns which you saw are ten kings who have received no kingdom as yet, but they receive authority for one hour as kings with the beast. These are of one mind, and they will give their power and authority to the beast. These will make war with the Lamb, and the Lamb will overcome them, for He is Lord of lords and King of kings; and those who are with Him are called, chosen, and faithful." Then he said to me, "The waters which you saw, where the harlot sits, are peoples, multitudes, nations, and tongues." In closing, God's judgments on these people groups continue in the Trumpet judgments into the second half of the Tribulation (Revelation 8-9). Now John is going to prophesy again about all these people groups, but only for the time period covered in the "little book" that he ate, which is the 3 ½ year period shown to Daniel, as discussed in Revelation 10:6. In fact, in the next few chapters John will prophesy about this 3 ½-year period two more times in two interludes. 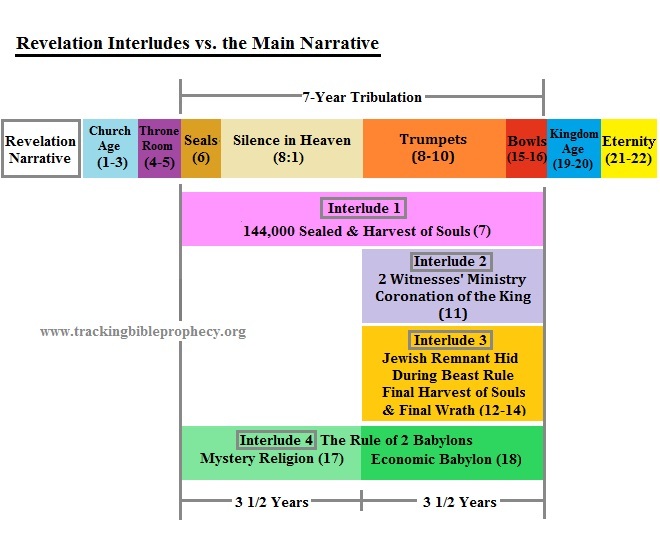 Recall from the "Revelation Introduction," an interlude gives us more information or a different perspective to the narrative. In other words, an interlude is a background story to the narrative, with clear indications that each interlude reaches back or forward in time, and generally returns to where the primary narrative left off.